Paddling the last stretch of the Grand River has been on my bucket list for years. I’d paddled the upper stretches many times. On one occasion my friends and I made it past the Paine Creek confluence, but that was by accident. We had parked our shuttle vehicle along the wrong stream. After we realized our mistake, we pulled off the river and hitched a ride back to the vehicle. Alcohol might have been involved. That was when we were young, irresponsible and in our “cabrewing” days. As I recall, that trip was fueled by Old Frothingslosh, the beer with the foam on the bottom. Now that I’m older and wiser — and you can no longer buy Old Frothingslosh — I set out to canoe the last stretch of the Grand River into Lake Erie. This was an exploratory trip. I wanted to try out LakeMetroparks canoe-in campsites along the way and recommend potential overnight excursions for other paddlers. 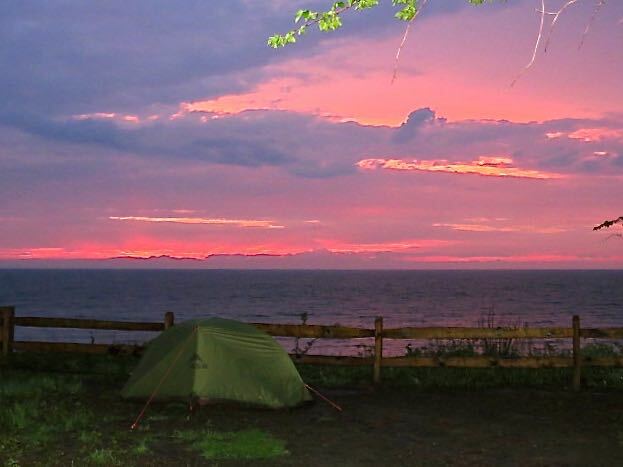 My plan was to set up a base camp the first night at Lake Erie Bluffs, about six miles east of Fairport Harbor. The next day I would put on the river at Grand River Canoe Livery in Ashtabula County, then spend five days paddling to Fairport Harbor Lakefront Park, where I’d land on the beach. Ultimately, I’d like to set up a trip where you could paddle along the shoreline from the mouth of the Grand River to Lake Erie Bluffs and camp there on the final night. But that would require cooperation from Lake Erie, which can be hard to come by. My main objectives for this trip were to explore the river, check out the campsites and survive to tell about it. The road gods and the river gods conspired against me. I set out early Monday morning and the Canoebaru seemed pretty happy, humming along 110 miles of interstate and controlled-access highways. I got off the freeway to scout out Fairport Harbor. Driving down Water Street, I was cursing the old man in front of me, who was creeping along a few miles an hour under the speed limit. The Canoebaru awaiting a tow truck in Fairport Harbor. Actually, he was doing me a big favor. I felt a jolt in the front of the car and it pulled sharply to the right. I managed to ease it to the curb, got out and inspected the damage. The left front wheel was pointed to the right and the right front wheel was pointed straight ahead. Not good. It could have been worse. The lower control arm could have broken on the interstate and my friends would be fighting over who got to inherit my canoe and camping gear. Apparently the only other vehicles that use that section of Water Street are huge trucks going to and from the gravel pits on the lake shore. Several of them came close to running over the Canoebaru, which might have been a blessing in disguise. Especially since I had taken the canoe off of the roof. While I was stacking my gear along the road I noticed a woman in an adjacent back yard watching me and talking on the phone. I walked over to her to explain the situation. She told me she was afraid one of the gravel trucks would hit my car and she called the police to assist me. Part of me wondered if she wasn’t more afraid that I was going to set up camp there. A Fairport Harbor Police officer arrived on the scene within seconds. He told me his main concern was getting the car out of there as quickly as possible, so it didn’t get run over. He was more concerned about that than I was. 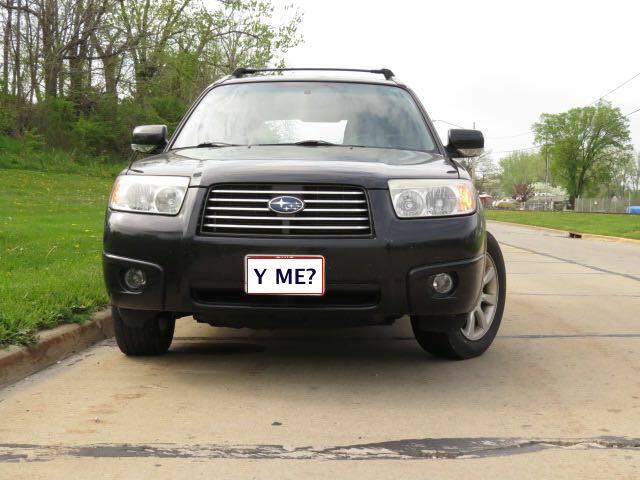 He proved to be quite helpful, finding the phone numbers for a tow truck and — aptly named — Adventure Subaru in Painesville. Why not? They would become part of the great adventure. 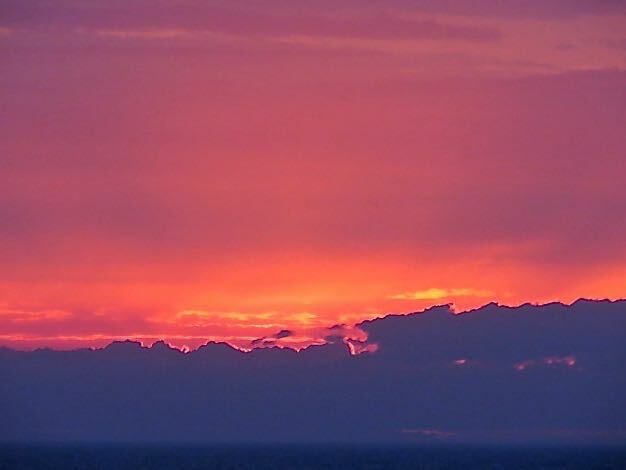 The sunset from Lake Erie Bluffs — before the tornado watch. As would my friend, Becky Raubenolt, who came to my rescue. Becky lives in Lake County and does a lot of volunteering with Lake MetroParks. She carted me and my gear to Lake Erie Bluffs and would help with the logistics during the week. Her grandson, Cooper, served as copilot on one leg of the shuttle. I eventually made it to Lake Erie Bluffs, where I enjoyed a beautiful sunset. As darkness set in, the winds began to howl and the NOAA weather app on my phone advised of a tornado watch. I had just put some brats on the charcoal grill when the storm arrived in earnest and I dove into my tent. With winds gusting up to at least 35 mph, I’m convinced that the only thing that kept the tent from blowing into Lake Erie was me. As I lay there, wishing that I weighed more, my cellphone squeaked. (My ringtone makes a squeaky toy sound.) It was a MetroParks ranger advising me that I was in for some bad weather. You’ve got to love that kind of attention to detail. My body weight prevented the tent from blowing into the lake. I was relieved when he told me that he was west of me and the wind was letting up where he was. After the storm passed, I got out and surveyed the damage. Nothing had blown away and the coals beneath the brats were still glowing. Except for being black on one side, they were edible. Next: Camping next to a maintenance shed — and loving it.